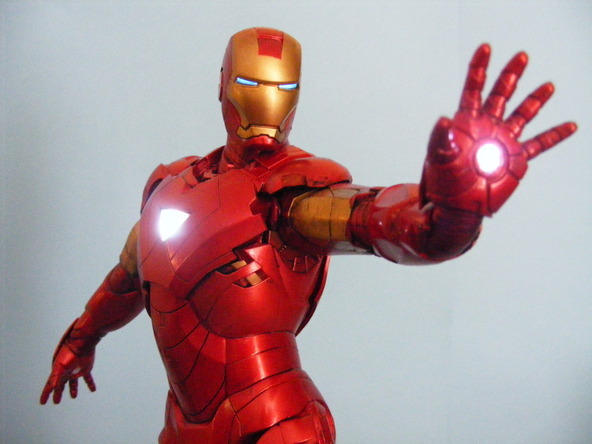 Starling proudly introduces our latest E/FX™ Light kit, "The Open Palm Pulse Effect" to enhance the 1/8 scale Moebius Ironman, but can be used with any comic super hero that will benefit from the effect. All lighting produced by bright energy efficient LEDs. Our kit is totally plug-n-play, but Steve found it was easier for him to cut the wires to the LEDs and splice them back together inside the chest. Always test fit your lighting kit to see what works easiest for you. Built with top quality components for longevity. 1x Fully assembled, with wired LEDs, Open Palm Pulse Effect kit with switch and 3aaa battery holder. 1x Heat shrink for those of you who want to cut your wires. Normal modeling tools, paints, and glue..